A FUN interactive kids pantomime with prizes and a ‘How to write a Kid’s Book’ workshop for grown-ups. IMAGINE scifi & fantasy characters and stories weaving their magic spell. Who loves writing about dragons, fairies … or superheroes? IMAGINE you’re a Super Space Kid saving the galaxy. 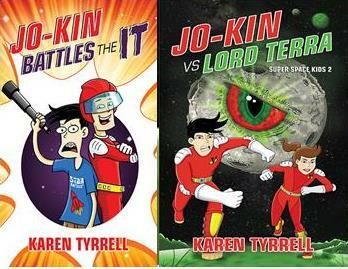 Me, Author Karen Tyrrell shares Jo-Kin Battles the It AND Jo-Kin vs Lord Terra Pantomime. I’ll be dressed as Captain Astra: Super Space Kid. Evil alien, Lord Terra will make a special appearance, wielding his SUPER evil powers. PRIZES for BEST Super Space Kid, Super Space Hero, alien or robot. FREE crafty activities and creative writing. Come join the FUN! … Seats will go fast. Are you bringing lots of kids? Karen Tyrrell award winning author will guide you how to IMAGINE, Create and Write a children’s book. 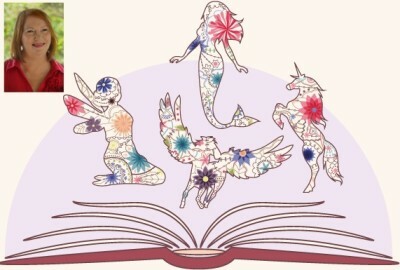 I will share my secrets in writing children’s stories that KIDS love. Karen is the award winning author of 5 Children’s books: Jo-Kin Battles the It, Jo-Kin vs Lord Terra, STOP the Bully, Bailey Beats the Blah and Harry Helps Grandpa Remember. Are you coming to join the Fun? Please tell all your friends!! Comment, share, like tweet and google plus. What a lovely theme Karen . I will bring the girls down for a fun time. They are hooked on super girl and are excited about Super Space Kids. 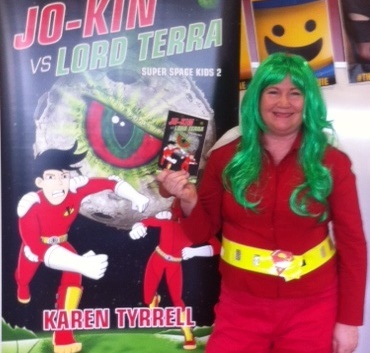 Thanks for your enthusiastic response to my Super space kids pantomime. Look forward to meeting you and your girls.